This image is intended to assist writers and roleplayers in determining accurate height denominations for these respective characters, as well as for general knowledge and trivia purposes. Feel free to distribute, the intention being to spread awareness. Additionally, I don't own this image. I did not make this picture, nor did I take it with whatever camera was used. The image comes directly from Comic Con 2005. The only alterations made to the original were edits to offset the blurriness. Measurements of both the American and metric systems will be provided for full clarity. Aang appears to go through a growth spurt from the beginning of the series to the end. In that case, 4'6" would be his height at his first appearance. By the end, you can see how much closer he is in height to Katara, who's a little over 5 feet (based on Azula's height -- Katara is taller). 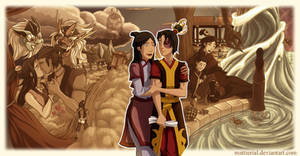 Azula had a growth spurt between "Zuko Alone" and her first appearance, so she isn't going to have another one. Most girls tend to stop growing at her age, so she can be expected to remain at 5'. I've seen some people think she's 5'3", all the way up to 5'7", but she's not of average height, let alone tall. She has really short legs. She apparently inherited the short gene from Iroh! Zuko is shorter than most people think. At his age, it's possible he could have another (small) growth spurt, but it's equally possible he won't. Only these characters have officially documented heights. All other characters can be determined with relative accuracy by comparing them against Aang, Azula, and Zuko. Do keep in mind that animation inconsistencies exist (Ty Lee being both shorter and taller than Azula depending on the episode, for example), so it's probably best to go with how these undetermined characters are most often drawn. This would make me half an inch taller than Zuko. My mind is blown. o_O I always knew the characters were short, especially in comparison to the adults for some reason, but I never thought about how tall they actually were. Consider your mind blown! I mean, some of the adults are downright enormous (who remembers Bato? ), so most of the kids look even shorter in comparison. Turns out they're kind of short by any measure. No way. Zuko's my height. I'm a shrimp. My nickname is Little Hobbit. WHAT. I feel so conflicted. You and Zuko can both be Little Hobbits together? A lot of people are under the illusion that Zuko is of average height, if not tall, so it's nice to see someone who recognized how short he really is. Aang starts off tiny, but he has a growth spurt that puts him close to Katara by the end of the show. That means he's roughly Azula's height by the last episode, give or take a few inches. Well, the story is based on Asian cultures (there is no Asia in the Avatarverse, per se), but the expectation that he should be tall is a little strange. I regularly see heights for him at 5'9" and above, which is all kinds of ridiculous. It's just not true. Comparing him to the other adults would make that clear. A 5'9" Zuko would lead to a lot of basketball player-sized adults, and that's just not the case. Both Zuko and Azula are short, just like Iroh, even though their parents are exceptionally tall. Genetics work that way sometimes. I like Zuko being shorter, too. It's a nice divergence from what we normally see. That you think it's cute makes it even better. Exactly! Glad someone gets that and likes it about him.